We all know the need to do our bit to reduce our environmental impact, but that doesn't mean we can't use the odd cool gadget or app to help us. If you visit or live in London then a new free app for iPhone, iPod touch and iPad users who like to get about on two wheels is here to help you turn last night's beers into today's green travel calories. The London Cycle app has a route navigator with cycle routes across Central London to keep you safe on two wheels. 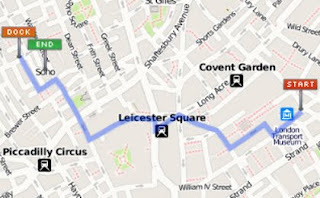 It also has all of the Barclays Cycle hire stations mapped. The killer part of the app is that gives live updates of how many bikes are at each hire station and how many parking spaces are left if you are returning a bike. Add to this a cost and rental timer so that you know when your free 30 minutes is about to expire or how much you ride has cost you and we've got a great green app for any London cyclist. 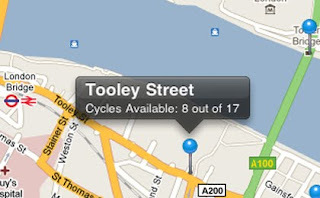 On your bike then and get this app here. In late 2007 Amazon released it’s first e-reader device, the Kindle 1. It was called revolutionary, and it truly was. Being able to download books anywhere in the world, for only the price of the book itself with no download fee, is fantastic. I ordered a Kindle 2 from CeX and I instantly fell in love with it. I’ve read two novels on it in two weeks, both of which are over 1,000 pages long. On top of that I’ve only charged it once, and that was the day I got it. Using the free 3G wireless connection and it’s limited text web browser does drain that battery but it’s very simple to turn the 3G on and off to make it last as long as possible. That 3G is put to very good use in Amazon’s WhisperSync service as well, which is their way of syncing all your books to all your Kindle devices and your place in them. I can read my books across my Kindle, phone and laptop all using free apps and keep my place using bookmarks. The free apps for desktop and Android are also really good, the Android one has the ability to turn the text to white on black as well which makes it much easier on the eyes. The device is a really great size, about the same as a large paperback but as thin as an iPod Touch. It’s really lovely to hold and very light, which is good as you end up reading it for hours on end. I have a leather cover for my Kindle but I only use that to keep it looking good, not when I’m reading. But enough of the technicalities, lets get to the meat of the review and talk about what it’s like to read books on the device. The screen is great, it’s a six inch e-ink screen and because of that is has no glare whatsoever. It also only uses battery power when you’re changing pages meaning that you can leave it on for days and not use a single second of battery. 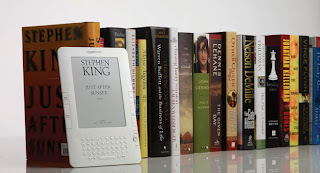 Reading and buying books on Kindle is very addictive as well, especially as the price of the books is usually lower than the print versions. I was able to pick up The Girl With The Dragon Tattoo for almost nothing and of course there are some less legal ways to get books onto your Kindle, though I’ve really not had to. All in all the Kindle is a fantastic device, perfect for pretty much every situation you might want to read in. I’ve taken it to a festival, I’ve laid it on my lap whilst eating, I’ve taken it onto every form of public transport you can imagine and I’ve used it sat on the roof of my CeX store. It’s getting me to read more and more books and it’s saving me money on the print editions. Now I’ve used it, I can’t bear to part with it. You should definitely get a Kindle. As Amazon controls the sale of new Kindles through its website, CeX is the only high street retailer you can try a Kindle for yourself. There are I feel, two very different ways you can go about writing a review for a PC & Mac game as iconic as Starcraft II; you can discuss it with emphasis that this is a sequel to one of the best real-time strategy games of all time, or try to steer clear of this fact and look at it as a stand alone experience. One should ask why the latter is even an option, but this is largely because Starcraft I was released in 1998, so long ago that for the current generation of gamers, the word Starcraft is only a myth and the experience is lost in history amidst the older generation of gamers. To appease both sides of the argument, Starcraft II is an excellent sequel but also a fantastic title in its own right. It does not stray off the path that made the original Starcraft so incredibly popular, which also means fans of traditional RTS will have no problem picking the game up. It also introduces some very impressive additions to the traditional game-play playing to the die-hard fans of the series while also creating vast replay-value for everyone. Starcraft II is one of the most impressive technical, visual refinements of any series and mixed with incredible multi player, a long, interesting and in-depth campaign mode and huge upgrade and customization options, this is really an RTS fans dream come true. Looking at the campaign first, it might come as a surprise to fans of the series that while the game still holds true to the three races, Terrans, Protoss and Zerg, it is only the former that has a campaign available. This is quite disappointing that Blizzard chose to omit the latter two races largely because you will not be able to get to grips with their arsenal for multi player warfare unless you play skirmishes or challenges and inevitably, Blizzard will release the other two campaigns in either a package or download, either or I’m sure, will cost more money. Fortunately, this is almost the only minuscule drawback from what is otherwise, a full package. The campaign is long, comprehensive, challenging and offers plenty of incentive to come back and complete levels over and over in an attempt to unlock all of Starcraft II’s campaign achievements and all the different upgrades for your units. The campaign is presented in absolutely phenomenal cut-scenes that jump out at you, this is helped further by a fantastic narrative and great voice-cast. The game even offers certain ‘decision making’ moments that can effect the flow of the story, once again offering a reason to return to the campaign to find out how things could pan out differently. Each mission seems to feel totally unique and everything is strung so well together that you feel progression both in the story and on the battlefield. If that wasn't enough, there is even a role-playing experience integrated between missions that allow you to interact with other shipmates to gain valuable knowledge or important upgrades, units and weapons. Once you have completed the campaign and you feel it is time to take the next step, online multi player is the inevitable solution. Let it be known straight away that Starcraft as a series, is renowned for its highly competitive multi player, this is one serious game. Don’t let this be off-putting, think of it more as a warning to not jump into the deep end straight away. Alongside competitive ranked matches, the game offers non-ranked game modes to warm up and get to grips with the other two races. Starcraft II offers a ladder ranking system that does pit you up against players of a similar level should you choose the competitive ranked route, and there is plenty of challenge and content to keep the online action fresh and engaging. Boasting a variety of diverse maps that offer plenty of space and room for numerous players, you will see your online experience take up countless hours of your time as there is little reason to stop engaging in such an incredible game. Once you have had the chance to experiment with the other two races you will see that each army has it’s own distinct advantages and disadvantages, for example the Zerg race are known for their speed and rush abilities while Protoss are much more tailored for long lasting warfare with their strong armored, laser bearing units tipping the tide of battle. Whichever race you choose to pledge allegiance to, you will find a balanced and thrilling adventure, each race has countless upgrades and expansions that make using and mastering all three a sheer joy, while at the same time, they are all so incredibly balanced that clever wit and genius tactics will be needed to prevail. Of course not everything has to be done online, being a traditional RPG, offline skirmish modes are available that allow you to tackle enemy AI in all the same modes that are available online. This however goes only so far as the true competitive spirit comes from facing other human opponents, as no matter how tough the AI is, it simply doesn't play like a human would. If you want a more structured way to become accustomed to the various faction’s units, then there is also a challenge mode available that goes through advanced game mechanics with you, letting you get to grips with some of the more technical sides to units and their abilities, preparing you for more advanced combat online. Starcraft II promotes the idea of community amongst its gamers; this being achieved through the Battle.net online service that acts as the mediator between the community and the actual game. It is through here that you will find all the different achievements available to unlock, your friends lists, all your accomplishments, leader boards and much more. This really gives you a sense of togetherness as everyone plays and enjoys Starcraft II, especially your friends who will be constantly updating you on their achievements through pop ups. At heart this is a very social experience, with the game forcing you to create an account to actually play the game in the first place. This may seem a nuisance that to unlock achievements you must always be signed in and online, with absolutely no way of becoming invisible and going offline. However, this is a small price to pay for what is otherwise a beautifully integrated management system. The idea of community is enhanced further with user-creation tools being available to create new levels and game-modes for Starcraft II. While not being as simple to use and integrate as say games renowned for their user-creativity like Little Big Planet and Modnation Racers, it is still an interesting way of passing the time and adding to the already ever-growing lists of customized maps and game-modes. From a hardware perspective, it is a sheer joy to see a game of such high quality, able to run on a variety of different systems. Indeed if you want the best visual experience, a top of the line system will be required, but those who understand the joy of high quality RTS game-play will tell you that beautiful graphics are merely a bonus, as long as the game-play is top notch, which of course it is. As for the first-person sections and cut-scenes throughout, these do suffer on low-spec systems, but to nowhere near any degree that makes it unplayable or unwatchable. To conclude, Blizzard was certainly not trying to re-invent the wheel with the sequel to Starcraft. This in many ways is a really good thing because it sticks to what it does best, fantastic traditional RTS game-play. With a large variety of tweaks and enhancements, there is plenty of new content to keep things feeling fresh for fans. On the flip-side of the coin, this is an amazing stand-alone experience for those of you who never played the original. The game serves up plenty of backdrop information to fill you in on the story so you don’t feel left out, and little else is really needed to enjoy Starcraft II. The two missing campaigns, no local-area link up and no way of playing the game unless you’re online are irritating omissions but are greatly overshadowed by the endless list of things Starcraft II does expertly. Little else can be said to fault one of our generations most sought after and successful PC & Mac games. I chose to give Scott Pilgrim vs. The World a moment of my time due to a number of reasons; first of all, I feel I do not give enough credit and recognition to some of the incredible online games we are able to download. Games such as Braid won many awards but players steer clear of games that they cannot get physical copies of, and while this is indeed understandable, one cannot help but feel sorry for those people who are missing out on a lot of fun. Secondly, it made sense to me to review Scott Pilgrim with the brand new movie coming out staring Michael Cera. Scott Pilgrim takes its formula from traditional side-scrolling beat-em-ups like Golden Axe and my personal favourite retro game of all time, Streets of Rage. However, it plays with this formula with outstanding 8-bit and 16-bit graphics, some clever RPGish elements, lots of great laugh out loud moments and fast paced combat. While there are some issues surrounding Scott Pilgrim, most do not interfere with the actual game-play so once you dive in, prepare to experience a fun and rewarding experience that you can share with your friends. So the story is pretty simple here, Scott Pilgrim wants to date the love of his life Ramona Flowers, but in order to do that, he must defeat her seven evil ex-boyfriends in combat. The game sets out beautiful stages ranging from frozen suburbs, to a film set, all the way to a subspace highway. Each level spawns its own set of clever and interesting bad guys to beat up, they all have different ways for you to interact with them and offer a considerable amount of replay value if you want to find all of the level’s secrets. Naturally, at the end of each level you will come to a boss fight, which all prove to be thrilling, crazy and challenging, keeping the combat fresh and entertaining. Scott Pilgrim incorporates RPG elements very well, allowing you to collect coins and spend them to upgrade your different stats, the generic strength, defense, will power and speed points. Lord knows you will definitely need to upgrade them because the game can be horrendously challenging as you become overwhelmed and surrounded by enemies. This can be manipulated by the games three-difficulty modes, but even on ‘average joe’ without powering up you will find yourself in a lot of trouble. Never fear however as in each level you will find shops that sell loads of whacky food products, books, DVDs, CDs and so forth. Each one cleverly hints at what it will upgrade but you can never actually see until you purchase the product. Some people have complained about this feature but if you do not understand that ‘bionic arm’ is more than likely going to boost strength and ‘speedy porcupine’ is going to raise your speed, then quite frankly you need some lessons in logic. Scott Pilgrim makes it very clear that the game should be played with friends by its marginal difficulty levels. You can take up to 3 friends with you along the journey and boy is it a lot of fun. There are four playable characters in the story so its not like you are using just template characters and they all have varied attacks and stats, making it just a little bit different when changing characters. You can also sign in with your gamer profile, which allows you to collect the various trophies on offer in the game. The one thing that seriously lets Scott Pilgrim down is the lack of co-op online, for me this wasn’t a particular issue because my friends were local so we could all play off of one system, but those looking for an online experience will not find it here. Another issue is there is no ability to instantly drop-in or drop-out of play. This means that you and however many friends will have to start from the main menu to play together, this is completely illogical as all old side-scrolling games featured this function, it was almost completely staple so it puzzles me why they chose to omit this function. Technically, the game impresses on multiple levels, a fitting soundtrack that really revives the old 16-bit era strings all its fluid game-play, great graphics and RPG elements together almost flawlessly. Ubisoft have done a great job forming a technical and deep game, as you level up by defeating enemies you will unlock new moves and combos that help throughout your adventure. There are tag team moves available, super special finishing moves when four players play together and the ability to summon aid mid-combat to help you in sticky situations. Your health is measured in heart points and you also have gut points to use your special moves. If you get knocked out however, the game transfers your gut points to health points and if you get knocked out without gut points, you lose a life. A clever and cheeky mechanic in Scott Pilgrim is the ability to turn into a ghost and steal your friend’s lives once you have run out yourself. This is irritating but oh so much fun at the same time, creating a little bit of selfish competition for survival. You can share health and coins as well, furthering the idea that this really should be experienced with friends. Ultimately Scott Pilgrim is a very entertaining side-scrolling beat-em-up. It takes the old formula that we all know and love, implements it well minus the lack of drop-in and online co-op, while at the same time re-styles the formula if you will with its own whacky and cartoony artwork, RPG-like mechanics and a whole load of style. Scott Pilgrim is available on the PSN and Xbox Live Arcade and should not be missed for those looking for a fun trip down nostalgia lane with a few twists to keep things fresh and exciting. Be sure to check out the movie as well coming out at the end of the month, it looks like an absolute blast. OK I'll admit it. I actually quite enjoy playing crap games. In the same way some people like watching low-budget schlocky horror films or read trashy magazines, I get a kick out of playing crappy games. I dig beneath the poor graphics and repetitive gameplay, in the hope that I'll discover the proverbial diamond in the rough. But 505 Games' latest offering almost pushed me beyond what even I could bear. Naughty Bear's concept is part 'Telly Tubbies' and part 'Halloween'. You play as the eponymous disenfranchised Naughty Bear, who following his exclusion from the latest Teddy Bear's Picnic, decides to go on a murderous rampage. By stalking, stabbing and scaring his fellow bears, Naughty can finally quell the ever-cheerful yet completely psychotic voice in his head. Sounds compelling doesn't it? In truth, Naughty Bear could have been an interesting and unique game, but ends up barely being a mediocre one. When I first loaded up the game, after a seemingly never-ending tutorial sequence, I was ready to start terrorising teddies. Having read all the instructions on how to sabotage phones and escape vehicles, and how to drive bears to the brink of suicide, I eagerly anticipated a slow, methodical descent into the mind of a killer, albeit a soft and fluffy one. My hopes were shattered immediately upon entering the first area; the small environments were heavily populated by hostile bears, making it impossible to carry out my subtle yet bloody scheme. Upon further inspection, I found that the level was literally littered with weapons and items, and the score multiplier countdown ticked away with vicious velocity. For all its talk of sabotage and stealth, the game seemed designed to encourage a frantic killing spree rather than a more carefully planned approach. To test this, I replayed the same level, dashing from house to house and beating to death any bears I found with a stick. I attained a gold trophy and roughly quadruple the points I had acquired on my previous play through, in barely half the time. Naughty Bear's presentation is appropriate, if not terribly impressive. The simplistic graphics and cutesy sound fit in with the game's 'children's show' aesthetic, but the annoying camera and limited number of animations spoiled the experience. Repeatedly watching Naughty spin an unsuspecting bear around and yell 'BOO!' became old very quickly. Repetition had better be something you enjoy if you buy this game, because not only are the levels and objectives very similar (there are only four environments in the entire game. FOUR!) but you are asked to replay each scenario several times before you can unlock the next one. In fairness, you are asked to do so with different parameters in place (such as 'don't hit anyone' or 'make everyone go insane'), but this doesn't make progressing through the game any less teddy-ous. As a time-killer, a game to play while the dinner's cooking or to wind down from an intense online session, Naughty Bear is a nice change of pace. Once you find the right pace to combine stealthy sabotage with rapid violence without losing your multiplier, there is a modicum of fun to be had. With the addition of downloadable content and online multiplayer, the more deranged among you may be drawn in. However, I do wonder who this game was aimed at. It is too childish and simplistic for older gamers, yet obviously the subject matter is above the heads of little kiddy-winks. I'm really not sure who I could recommend this game to. 505 Games' Naughty Bear is a game that aims high but hits low, less a case of 'Fur-iday the 13th' and more of 'Tom and Beary'. That is to say it was pawful. I couldn't bear it. How're these bear puns working out for you? Lukao gives Naughty Bear 3 brutal murders out of 10. It is true that the never-ending wait for certain titles to be released can cause a stir in the gaming world. When we talk about hype surrounding games, there is little competition to beat the Japanese surge for Dragon Quest IX. As a series, the game holds striking popularity and continues through each instalment to show the world why classic RPG game-play is still more enjoyable than ever before. Indeed Dragon Quest IX knocked Final Fantasy XIII off of Japan’s most anticipated game chart after the latter held firm for 15 months. Then Dragon Quest IX swiftly followed to sell approximately 2.3 million units in the first 2 days of sale, out of the alleged 3 million units shipped across the country. These are all impressive figures but we must not forget one, crucial point; just because it is popular in Japan, does not mean it will be in Europe and North America. Our taste buds for games and genres differ significantly but this was taken into consideration when the new Dragon Quest project began. This instalment is primary designed to attract interest from an overseas market, so us, by introducing multiplayer and subtle features that help those new to true classic RPG game-play, easily access the game’s terrific content. The plot in Dragon Quest 8 holds true to the enchanting style of the classic RPG; you play the role of an angel who’s duty is to guard a small village, you are stripped of your angelic powers and are forced to explore the human world and become entangled in a whirlwind of adventure and questing. Diversity intertwines this stereotypical RPG formula straight from the get go when you discover your ability to almost completely customise your character and party. You will be asked to create the protagonist to any way that takes your liking, gender included. The same then goes for your party members. This is a fantastic addition to the series and really allows the characters to gain personality. This is then followed strongly by tremendously versatile and interesting gear gathering system that helps to further make each party member unique in bizarre and intriguing ways. While aesthetics prove a fun way to pass the time and divulge from the other portions of the game, we cannot forget that the most important part of Dragon Quest IX, is the role-play and battling. The game categorises classes in the form of vocations, which are warrior, mage, priest, martial artist, thief and the default minstrel. Once you dwell deeper into the game you will unlock advanced classes including the ranger, sage and paladin by taking up advanced quest challenges, with more vocations available. The game allows you to change vocations and choose what vocation each created character starts off with, apart from your main character that is a minstrel at default. Each character’s skills and levels change depending on what vocation is active and using a vocation will help level it up. This allows players to mix and match parties of different vocations in order to come up with devastating and effective partnerships. This also offers a tremendous amount of replay value and versatility as it takes time to level vocations and see their advanced techniques and abilities. Dragon Quest IX’s battle system is formed of a first and third-person style, where the former is used to target enemies and latter to watch the battles unfold. The combat includes traditional combo systems and a variety of spells to use. The combat itself is traditional turn-based and with numbers for the most part, stacked significantly against you. In addition to this, Dragon Quest IX is considered a very difficult game so don’t be shy to take some time to stop and level up in particular sections to avoid getting annihilated by some of the game’s harder foes. A new addition to the series is the ability for players to see silhouettes of enemies in the wild, this removes random encounters almost entirely and allows players to choose who or what they fight or if indeed fighting is the correct option at that particular moment in time. Technically, Dragon Quest IX demands applause. Once again Akira Toriyama’s famous artistic style shines and oozes personality in almost every monster and character throughout the game. Indeed visually the game is stunning, with great environments and plenty of colour breathing life into your adventure. The audio is also a pleasant rehash of the series, but this works well considering the series hasn’t strayed far from what it’s good at. One of Dragon Quest IX’s most impressive new features is the cooperative multiplayer available. You can access a game from two to up to four players that pits you and your friends against the Dragon Quest world. You get to keep all your levels and items, while levelling up with your friends. There is no noticeable lag and with free roaming available, this feels like an entirely different and exciting game mode that offers plenty of fun and replay value. There’s always plenty to do in Dragon Quest IX, whether you are progressing through the very long and compelling campaign mode, to completing the large variety of quests and side missions available, or even finding items to mould together in the alchemy pot. Whatever it is you choose to do, you will find yourself advancing in levels, unlocking brand new weapons and armour, while at the same time, having an absolute blast. To conclude, Dragon Quest IX does not stray from the path of traditional role-playing games. If you are not a fan of games that force time commitment, then perhaps this is not the game for you. Those looking for a long, thrilling and challenging adventure simply cannot go wrong with a game with this much content. This has to be the best hand held role-playing adventure we have seen to date; do yourself a favour and go get Dragon Quest IX. Those lucky enough to own a DS XL can see this game in even better quality on the large hand held’s screens. I'm not a great fan of military shooters. When given a choice of FPS games, I'd take an over the top sci-fi adventure over a realistic Andy McNab-a-thon. So when my editor slapped a copy of Sniper: Ghost Warrior on my desk (if you can believe that's how things go on here at blog.webuy.com) I was understandably disappointed. However, nigh on 8 hours later, I found I had run through an entire gamut of emotions, from pleasant surprise to incredible frustration. From relatively unknown developers City Interactive, Sniper: Ghost Warrior promises strategic sniping and stealth action, but can the Polish publishers lure the military crowd away from Call of Duty and Ghost Recon long enough to score a headshot? The first thing that struck me upon loading the game was the incredible visuals. From the opening sequence all the way to the last level, I was entirely blown away by the absolutely breathtaking environments. I really can't emphasise enough how impressed I was by the scale, detail and intricate design of each and every stage, as well as the immersive weather and lighting effects. However, while the amount of foliage present on each level was visually stunning, it often impacted negatively on the gameplay by obscuring vital shots. You would have thought that a professional sniper would learn how to clear grass and leaves from in front of his scope! From a gameplay standpoint, I was curious to see how Sniper: GW would keep players interested as in my opinion, sniping is only one aspect of FPS games and while it often takes skill to be a good sniper, I couldn't imagine a whole game based on this single discipline holding my attention (no, I'm not counting Silent Scope as an FPS game). Luckily, Sniper features a detailed sniping system, which asks players to adjust their aim according to distance, wind speed and heart rate. On normal difficulties a red dot slowly resolves on screen to help novice players make the shot, but dead-eye sharp-shooters can opt to do without in hard mode. The developers do well to mix things up, alternating stealth with sniping sections, often asking players to choose who not to shoot in order to slip by unnoticed. However it is during these stealth sections that the erratic AI reveals itself, often spotting you at inhuman distances and draining your health within moments. On the earlier levels it was a lesson in patience, but towards the end of the game I found myself furiously cursing the apparently telepathic AI and unfair checkpoint system. At certain points the player is asked to engage in close-quarters run-and-gun segments which, while they are a fast-paced break from the slow tension of the majority of the game, are fairly forgettable. Speaking of forgettable, Sniper: GW's story is so throwaway that I was tempted to not even mention it in this review. All in all, I actually did enjoy most of Sniper. Lining up a shot until your breath stabilises and scoring a perfect headshot from over a mile away (complete with the celebratory bullet-cam) is definitely satisfying, but there's not much scope (har-har) for replay value here and the main game is not terribly long. There is a simple online component which provides some cat-and-mouse sniping fun, and I dove in for a session. You know those frustrating moments in online shooters when you are suddenly killed by some unknown assailant from across the map? Imagine that, but FOREVER. That's like my own personal Hell. Lukao gives Sniper: Ghost Warrior 6 headshots out of 10. Which is only 60% accuracy! Today we are going to be looking at Arc System Work’s 2D fighting game, BlazBlue: Continum Shift. With the illustrious Guilty Gear series behind Arc System, there was little doubt that the original BlazBlue Calamity Trigger was going to be a huge success. Well, here we have an updated, enhanced and simply put, better instalment of a very appealing, technical and fun 2D fighting experience. What BlazBlue offers as a series is a phenomenal roster of diverse and interesting characters, what it lacks in numbers of available characters, it more than makes up for in their technicalities. Continum Shift will give you 12 characters to choose from and a further 3 available by playing through the game and unlocking them. Each character plays completely different to the next and this is a truly unique experience, some characters even holding incredibly intuitive powers and abilities that have never been implemented before in fighting games. For example, Iron Tager has the ability to magnetize his foes so they get drawn to him to allow for effective and devastating close combat. Other abilities are not as intuitive but all fit into the game fluidly, like Ragna’s ability to absorb health using his special weapon. It’s truly satisfying to see that while the game plays so differently to most conventional fighters, the way moves are pulled off feel very familiar and you will easily master the game’s basic play-style with minimal effort. That’s not to say however, that being good at Continum Shift is going to be easy, on the contrary Arc System Works pride themselves for offering a very technical package, one that can take time to truly master and at times, can be a little intimidating for newcomers. Each character’s move-set is mapped through a weak, medium, strong and drive attack, the latter being unique for every character. On top of this, you are pretty much expected to learn the fundamental mechanics of cancelling attacks, rapid cancelling, juggling and long complex combos. I would be lying if I said this was easy, but it provides a satisfyingly challenging learning curve for those looking for something a little bit more technical from their fighting games. Fortunately, one of the major improvements Continum Shift has over Calamity Trigger is the introduction of a fantastic tutorial mode. I absolutely loved going through the process because it really makes you feel like you learning how to play the game like a real professional, which means that everyone who comes out of the tutorial should have a good grasp on the technicalities of the game. It offers demonstrations, tips and even in depth character tutorials so you can get personal with your preferred choices as opposed to learning a generalisation of moves and abilities. If you feel that the tutorial didn’t give you enough time to burn the combos and abilities into your memory, then Continum Shift continues to further the learning experience by offering a Challenge Mode that sets you complex combos and moves to complete so you can become an effective combo-executing machine. Once again however, patience and trial and error will be required for the latter stages of both modes, but if you are a newcomer and want the most from your BlazBlue experience, this is almost unavoidable. Once you’re got a taste of the action, you will probably want to start experiencing true combat and this can be achieved through various modes in Continum Shift. You have your standard Arcade mode that pits you against numerous AI opponents and allows for friends to jump in and challenge you. You can also choose to tackle a story mode but this feels somewhat drawn out and pointless, largely due to the game’s story lacking any depth or substance. Fortunately that’s not exactly what we bought the game for so it can be overlooked, but it seems all too much effort to sit through the boringly narrated cut scene dialogue boxes when you can just play Arcade mode. Of course the best mode is getting a buddy round and jumping into Versus. If your friend can’t make it round, fear not as Continum Shift has incredible online play with silky smooth connections speeds and minimal fuss. It has everything you’d expect from ranked to casual fighting and has plenty of configuration options to set up or join lobbies with different criteria suited to you. Other not so noticeable game modes are Score Attack mode for combo junkies and Legion, which is basically Survival mode. On top of Continum Shift’s incredible game-play mechanics, it boasts some of the best visuals to date. The beautiful anime art styles implemented by Arc System’s really bring each character and background to life. The vibrant colours shine on the screen and with plenty of varied animations during combat; you will find it difficult to not admire the beautifully structured sequences in front of you. Each character’s Astral Heat finishing moves are just gorgeous to look at and time and time again you will be annihilate opponents in such style that it’s hard to not come back and play over and over. BlazBlue: Continum Shift is certainly no walk in the park. There are layers and layers of advanced mechanics to be found, implemented and enjoyed. It can be daunting for those just picking up the game as there is a lot to learn, but that can be said for any competitive game, none of us were good when we first played Halo or Call of Duty or Street Fighter, it’s the same whichever game we choose to purchase. The thing with Continum Shift is, all of that hard work is certainly worth the fantastic experience you will become engulfed in once you put the time and effort in. The game rewards you for the commitment and gives back an astonishing experience full of replay value, challenge and fun. 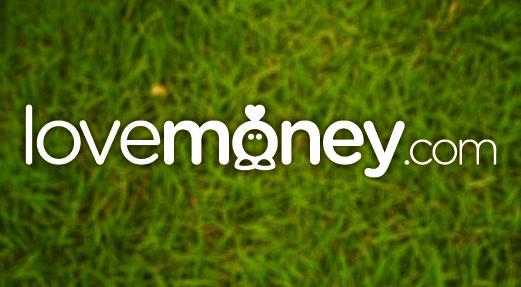 Leading personal finance site lovemoney.com recommends CeX as the best value retailer to buy a games console in an article entitled "5 ways computer games can save you money".